“I wanted to provide the students with an opportunity to engage with different types of sources,” said course instructor, StFX Catholic studies and history professor Barry MacKenzie. The exhibit, consisting of 30 artifacts from seven different local collections, is divided into nine different subject categories, all of which speak to some element of the story of Catholicism in Antigonish County. The category related to StFX University includes a ledger from the founding years of the university, a junior prom dance card from 1930, and an academic calendar from 1891-1892. “It would be impossible for me to identify a favourite artifact from the exhibit,” Prof. MacKenzie said, “but there are a few which I think are particular highlights.” Among those are Moses Coady’s hat, a relic of St. Francis Xavier, and a beautiful lectern presented to John Cameron, Bishop of Antigonish and Chancellor of StFX from 1877 to 1910, by the Congregation of Notre Dame, which ran Mount St. Bernard Ladies Academy. “Professor MacKenzie has demonstrated that material culture is an exciting way to ignite students’ interests in Canadian history,” said Dr. Laurie Stanley-Blackwell of the Department of History. 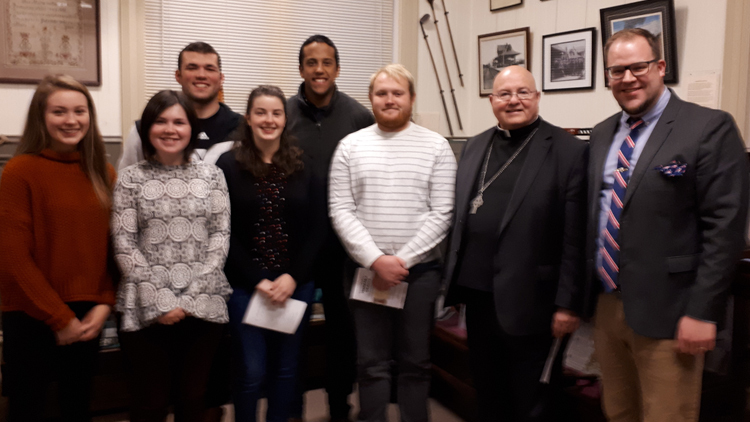 “I was pleased to be able to assist with this class project,” said Jocelyn Gillis, director of the Antigonish Heritage Museum, who has enjoyed her collaborations with Catholic studies and history students. “Venerable Objects” will run at the Antigonish Heritage Museum until late January 2019.